This article is published under the Creative Commons "Attribution-Share Alike" license. 1. Why create DocBook assemblies and topics? 1.1. Why prefer DocBook over DITA? 2. What is a topic? DocBook 5.1 introduces two new elements: assembly and topic. These elements allows to author large, modular, documents. Such documents are generally created and maintained over years by a team of technical writers rather than by a single person. Such documents generally share a large number of topics. That is, in such documents, most topics may be seen as reusable parts. For example, let's suppose a automobile manufacturer created two assemblies. The first one is a repair manual for automobile model A comprising 753 topics and the second one is a repair manual for automobile model B comprising 825 topics. These two repair manuals are expected to have a large number of topics in common, for example a topic explaining how to replace the battery of the car. DocBook 5.1 introduces two new elements: assembly and topic. An DocBook assembly serves the same purpose as a DITA map and a DocBook topic serves the same purpose as a DITA topic. DITA 1.3 is a proven technology which exists since several years. So why bother learning DocBook 5.1 assemblies and topics? In a nutshell, the answer is: simplicity. In our opinion, DITA 1.3 complexity costs do not allow small or even mid-size companies to use this documentation technology. This is not the case of DocBook 5.1. DocBook assemblies are quick and simple to learn. Suffice to read this tutorial to learn everything about assemblies. DocBook already has all the elements you'll ever need when writing technical documentation (e.g. videoobject, audioobject, calloutlist), while DITA 1.3 often requires you to create specialized vocabularies. DocBook comes with decent, flexible, well-documented, XSL stylesheets. A topic element is a semantically neutral container having a content model similar the one of the chapter element. A topic element is always stored in its own file. In terms of content, a topic element is expected to deal with a single topic and to be very loosely coupled, if not at all, to other topic elements. For example, avoid creating cross-references (xref, link) between topic A and topic B. In this tutorial, we'll use assembly elements which reference topic elements exclusively. In fact, any DocBook container (chapter, section, appendix, etc) may act as a topic —some contents dealing about a single topic stored in its one file— and as such, be referenced in assemblies. 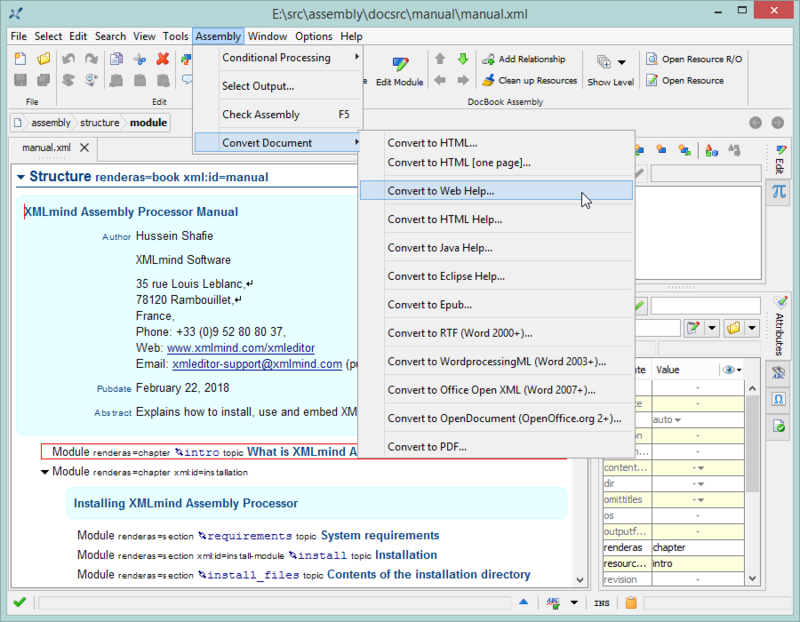 A DocBook 5.1 assembly specifies how to create a plain, “normal”, DocBook document (e.g. a book) out of contents “pulled” from topic files. The “normal” DocBook document created by the means of an assembly is called the realized document. A structure element specifies the contents of the realized document. It contains a number of possibly nested module elements. A module element specifies which contents is to be “pulled” from the topic file and how this contents is then copied into the realized document. A structure may be seen as a top-level module. Just like a module, a structure may be used to pull contents from a topic file and copy it into the realized document. First realized document, realized1.xml, is invalid as its root element is UNKNOWN. Second realized document, realized2.xml, is also invalid as DocBook 5.1 topics may not nest. In fact, these problems happened because the two corresponding assemblies, assembly1.xml and assembly2.xml, do not make use of attribute renderas. If a module pulls the content of a topic, then attribute renderas may be used to change the name of the pulled element. If a module does not pull the content of a topic, then attribute renderas must be used because it specifies the name of the realized element. Notice how an empty index element can be added at the end of the realized book. The realized document, realized1a.xml, created out of assembly assembly1a.xml, lacks a title, author, date, etc, to be usable. The info child element of a module or structure may be used to add metadata to the corresponding realized element. By metadata, we mean elements title, titleabbrev, subtitle and info (with or without title elements). However, the info child element of a module or structure may not be used to add metadata to the realized element when this module or structure pulls some contents from a topic. In this case, unless you use element info (or element merge), it's the metadata of the pulled topic which are copied to the realized document. Notice in the above example, how attribute xml:id="chapterA" specified on the structure has been used to replace the ID of pulled topic topic1. Without this xml:id="chapterA" attribute, the ID of the realized chapter would have been "t1". This happened because all common attributes found on a module or structure are copied to the corresponding realized element. In some cases, you'll want to replace all the titles of the pulled topic whatever are these titles (title, titleabbrev, subtitle). This can be implemented by using attribute omittitles=true. When a module element has attribute omittitles=true, then the titles of the topic are omitted in the realized document. Of course, this implies that you'll have to add an info (or merge) child element containing a title to module elements having attribute omittitles=true. A DocBook 5.1 topic may contain any kind of reusable content, even content much more fine-grained than some prose dealing about a single subject. For example, you may find useful creating topics containing just a single table. In such case, you'll want to create a realized element (e.g. a section) containing contents pulled from several of such “micro topics”. This can be implemented by using attribute contentonly=true. When a module element has attribute contentonly=true, then the contents being pulled is just the “body” of the topic. That is, the root element “envelope” of the topic is omitted in the realized document. The metadata (title elements, info element) of the topic are also omitted in the realized document. File assembly1d.xml: the “bodies” of topics topic1 and topic2 are added to realized chapter "Title of first chapter". We have already learned that attributes omittitles=true and contentonly=true provide the author with a simple way to modify the contents “pulled” from topics. In addition to these attributes, elements filterin and filterout, which are child elements of module and structure, also allow to modify the contents pulled from topics. Elements filterin and filterout generally have an outputformat attribute which specifies the class of output formats (web, print, etc) to which these filters apply. Example 9. Filtering topic contents when the "web" output format has been selected. In the above example, effectivity attribute userlevel has 4 possible value: beginner, intermediate, advanced and expert. This filterout element means: when selected output format is web, discard all elements pulled from topics having a userlevel attribute containing advanced and/or expert and no other value. We could have specified: <filterin outputformat="web userlevel="beginner;intermediate"/> which means: when selected output format is web, discard all elements pulled from topics having a userlevel attribute not containing beginner or intermediate. First filterout element, being a child of a structure, applies to all pulled topics. Similarly, filterin and filterout elements contained in a module applies to the topics pulled from this module and all its module descendants. This filterin element is used to override what is specified by the first filterout element. Elements pulled from topic topic3 having a userlevel attribute containing expert and no other value are still excluded, but those having a userlevel attribute containing beginner, intermediate or advanced are included. This filterout element having no effectivity attribute other than outputformat is used to unconditionally exclude the index from the realized document when selected output format is web. Note that using filterin and filterout elements in your DocBook assemblies should not prevent you from also using the “normal” conditional processing (also called profiling) supported by the DocBook XSL stylesheets. Elements filterin and filterout exist mainly to modify the contents of the realized document depending on the selected output format. Conditional processing generally uses more elaborate conditions depending on the computer architecture, operating system, security level, etc, to which the generated document applies. In the previous lesson, we have learned to filter the contents “pulled” from topics using elements filterin and filterout. However the filterin and filterout elements specified in assembly1e.xml all have attribute outputformat=web. This implies that the filters are not applied to pulled contents unless output format web has been selected. A structure element can indeed specify several realized documents depending on selected output format. So the question is: how to select an output format? The selected output format is passed as a parameter to the assembly processor. When this is not the case, then the selected output format is the value of attribute defaultformat of element structure. When this defaultformat attribute is missing, then the selected output format is the “implicit format”. The “implicit format” matches output, filterin, filterout elements without any outputformat attribute. In this lesson, we'll learn yet another method to modify the contents “pulled” from topics: element output, which like filterin and filterout, is a child element of module and structure. Elements filterin, filterout and output are considered in order by the assembly processor and relevant filters are combined. A filterin, filterout or output element is relevant if it does not have an outputformat attribute or if its outputformat attribute matches selected output format. By default, the selected output format is print and not web. When selected output format is web —that is, when generating HTML pages— do not split the first chapter into several pages (chunks); instead create a single HTML page containing the first chapter in its entirety. When selected output format is web, the single HTML page containing first chapter is to be created in a file called introduction.html. This output directive having no outputformat attribute is applied whatever the output format being selected. When selected output format is web, the index is excluded from the realized document. This output directive has the same effect as <filterout outputformat="web"/>. The ultimate way to transform contents “pulled” from topics is to apply an XSLT stylesheet to the topic prior to copying its content to the realized document. Transforming a topic is specified by the means of attribute grammar of element resource or by attributes transform or grammar of element output. In both cases, the transformation must have been declared by the means of a transform element found in the transforms section of the assembly. This transformation applied to topic topic3 results in (excerpts from realized1f.xml). In order to make topics as reusable as possible in different contexts, it is recommended to avoid creating cross-references (xref, link) between the topics. Instead, it's possible to specify navigation links in the assembly by the means of element relationship. The relationship elements are grouped in the relationships sections of the assembly. Free, open source, XMLmind Assembly Processor and free, open source, DocBook XSL stylesheets are all the tools you need to convert your DocBook 5.1 assemblies to a number of formats (PDF, HTML, EPUB, etc). However, if you prefer an integrated tool which, in addition to processing DocBook 5.1 assemblies, also allows to quickly and easily create assemblies and topics, then you'll want to give XMLmind DocBook Editor (or XMLmind XML Editor) Personal Edition v7.3+ a try. More information in "XMLmind Assembly Processor Manual - What if you just want to quickly experiment with DocBook assemblies and topics?". The value of attribute renderas is the QName of a DocBook 5.1 element. Example 1: "http://docbook.org/ns/docbook" is the default namespace: renderas="book". Example 2: prefix "db" is bound to namespace "http://docbook.org/ns/docbook": renderas="db:chapter". More precisely, attributes annotations, dir, remap, revisionflag, role, version, xml:base, xml:id, xml:lang, xreflabel. Class of output formats (web, print, etc) rather than an actual file format (PDF, EPUB, RTF, Eclipse Help, etc). where command assembly is XMLmind Assembly Processor. Using means which are specific to this assembly processor.